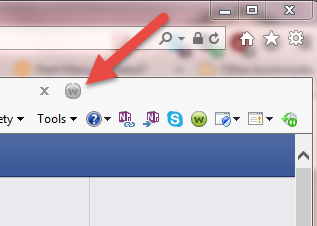 how can i restore the webroot password toolbar on google chrome?? 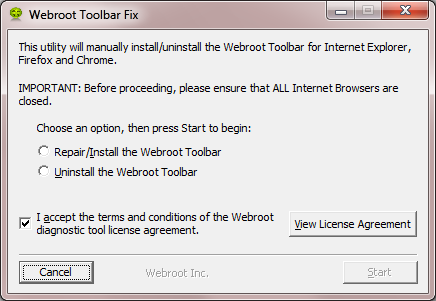 Hi ...How can I restore the Webroot Password toolbar in Google Chrome..I removed the extention and now cannot get it back. Baldrick doesn't appear to be online at the moment, but I think I can help you. The posts above are a couple of years old, so the info may no longer apply. You can download the password manager for Chrome from HERE. Please check the above out and come back if anything is not clear or if it does not help. I tried that earlier and it didn't appear on Chrome. IE is fine. 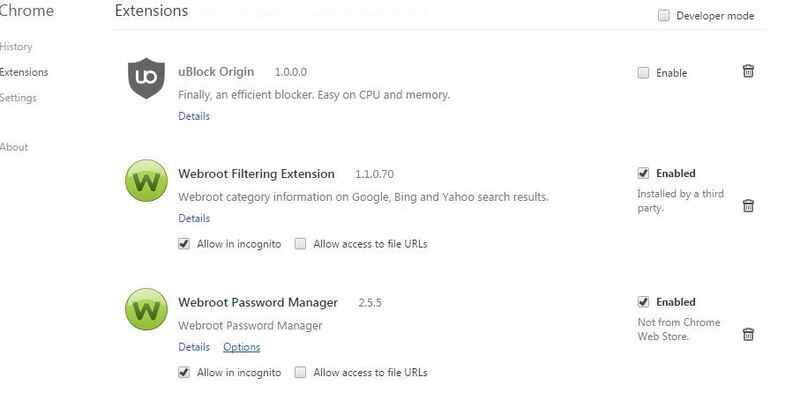 Would you check your Settings/Extensions and see if Webroot Password Manager is listed there and enabled by going to the Menu in the upper right hand corner and open Settings and then Extensions which will open on the left side of the Browser? If Password Manager is not listed there then please let me know. Hi Sherri....I have no Webroot extentions. thaank you for your time. I really like Google Chrome better than IE. The only other way to get your extentions back would be to do a clean install of Webroot. Would you want to try that? If so here are the instructions below. If you are comfortable with opening hidden folders and then manually installing the extension please let me know and I will give you the steps to undertake the manual process, which should resolve the issue for you. Just post back or PM (Private Message) me...I will be around this weekend. Hi Sheri....I followed the directions you gave me and still no Password toolbar. Thats ok, I'll just have Google Chrome save them instead. Tahnks for all the help. Sorry to hear that but it would be good for you to submit a Support Ticket and they will fix this for you free of charge with an active subscription. Or you could ask ? in a private message and he can give you these instructions to fix this as well. 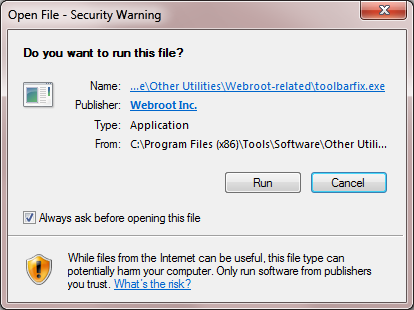 i just would like you to get the full functionality out Webroot PW Manager in all browsers. It's up to though.. I had this problem a year or so ago, and the bad thing is that while it can be fixed, the cause is Chrome itself. You see, a part of Chrome's security is that once an extension, like the password toolbar, has been removed by the user, Chrome will block it from installing again. The fix is fairly easy, just a little time consuming. I log into Google to make sure my bookmarks and settings are saved by Google.. then uninstall Chrome, reboot the computer, reinstall Chrome. As soon as I re-installed Chrome the Password toolbar was there and ready to use. I know this is probably not what you want to hear, but I hope it helps! Navigate to C:ProgramDataWRDataPKG...note that this is a hidden folder and so you will either need to adjust the settings using the Control Panel's Folder Options to view such folders, or you can use the programdataWRData commend in the Search field under the Start Menu and then select the PKG folder from the list provided. Then, open the Chrome Extensions page in the browser, and at the top of the page check Developer Mode to be 'On'. After each drag 'n drop await the message that one is trying to install a new extension to which you should answer 'Install'. Once both have been installed uncheck the Developer Mode and enjoy...you should have both extensions now working under Chrome. Not the official way of getting them installed but I hope that helps? Sir ? THANK YOU! I knew there was a better way but I just could not quite remember it. Again, well done! I am a little late with my presence on here but I wanted to again thank you for answering my ping. The mystery is solved! Awesome! This is wonderful information! Having same problem with Password Missing missing in Chrome. I just added Secure Anywhere to a new PC using PC Security. Password Manager on the old PC works fine. Cannot find it in the Extensions on new PC. Opened the PKG folder...the Web Filtering extension is in the folder, but the lpchrome.crx file is missing. Developer Mode is On. Any suggestions or other workaround? Or could the missing file be associated with the the PC Security PC addition function? Now check the programdatawrdata pkg folder to see if you have the missing .crx file...and if so you are good to go. If this fails to resolve the problem, you may need to contact Support for assistance. If your subscription is through Best Buy Subscription Software services, you may need to call them at 1-800-GEEK-SQUAD. Long time I'm not writing on this forum. I have this problem on Chrome.